I've been wondering for some time now, how my training now compares with the training I did back in the days when I was rowing. I dug up some old documents I had stored away in a file in the 90s. I was surprised to see that the philosophy wasn't so different from now. 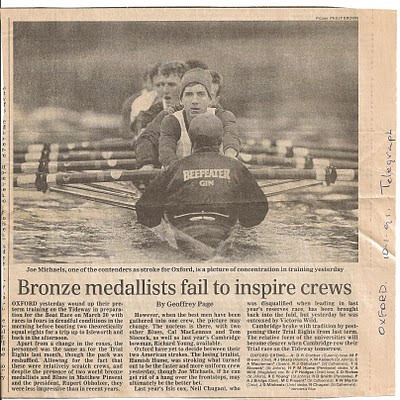 This is an example of how the British rowing squad / hopefuls were training back then: the training we did in the Oxford University squad was similar given that there were several Olympic gold medalists in the team and we all had to do the same training because we were literally in the same boat. I find it funny to see that we were supposed to be doing most of our training at some kind of aerobic pulse rate because none of us actually had pulse meters back in those days, and there was definitely a kind of macho culture in which you had to be seen to be pulling hard all the time, even when we were doing so-called "half-pressure". We would be videoed from time to time and you could more or less gauge who was pulling the hardest by the relative size of the puddles that would well up around the "blade" (oar). 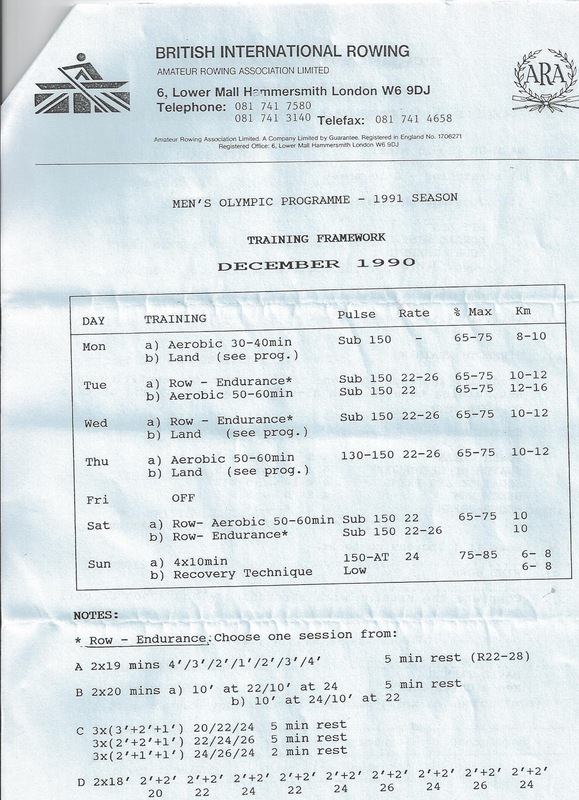 Even if we had stuck to the program below, there were three sessions of series a week, two of them back-to-back, and at Oxford we weren't such "wusses" to take a day off, the only exception being if we had done a test or a race the day before. I also found some stuff from the Oxford University Boat Club. According to the program, we were doing 5 two hour rowing sessions during the week plus two "double outings" of 3 hours on Saturday and Sunday, plus 3 weights / circuit training sessions in the mornings. That adds up to about 18 hours of training time a week, so it is fairly comparable to the sort of load I am under now - the difference is that I was only 18 years old back then and didn't have the kind of experience or one-to-one guidance to be able to assimilate that kind of load. On top of that was the pressure the hours of training + travelling + faffing about put on my academic work and my (then non-existent) student social life. I would do my "homework" in the van going back from the river in Wallingford, squashed up against the other rowers. I was amused last night to read the following "recommendations for a healthy diet" - remember, we are talking about an 18 year old kid, away from home for the first time. 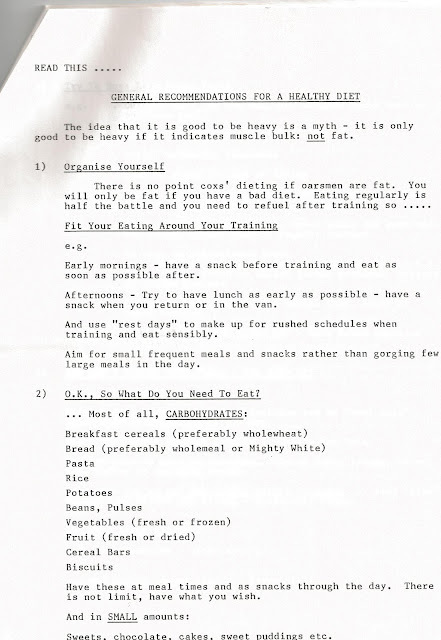 My problem was that I just couldn't keep my weight up - in rowing, as your weight is supported by the water, there is much less penalty to being bulky than in running, say. Especially as the most objective tests we did were on a rowing ergometer where you weight is fully supported, bulkier was better. The recommendations for a healthy diet say that there are "no limits" on carbohydrates such as bread. Well, I used to sit in my college room and work my way through a loaf of bread with the aid of a toaster and a pot of marmite to make it more palatable. My rowing training coincided exactly with the time when lunch was available at college, so we managed to convince the staff to let us eat with them, at the slightly earlier time. Dinner was served in a hall and we had to wear - get this - a shirt, a suit jacket and a gown(!) - many times I would have to slip these items on over my all-in-one lycra rowing suit if I were to make it in time. We perfected a little trick whereby we would eat the main course or pudding so quickly that we could jump to another table and get served again: sometimes we would eat 3 main courses and 3 puddings. What an incredible metabolism I had at that age! 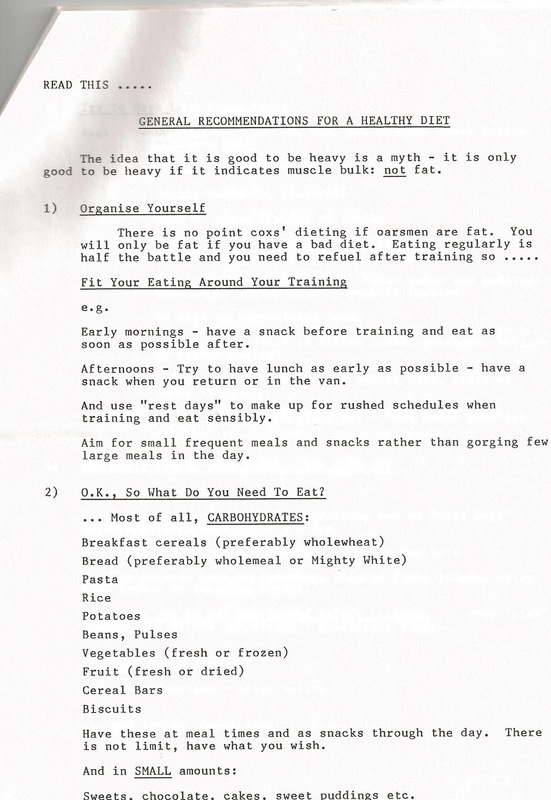 Still, now knowing that "you are what you eat" and that, had I been eating properly, I might have been able to tolerate the training better, it makes me slightly sad. I hated the training - it was boring and hard and seemed pointless. Pointless because there were times when we would train more and more only to get more sluggish. I vividly remember one day our coach asking us whether we thought we were training too much - after a few nervous glances someone said (I even remember who was first to say it) "No, of course not". The fact was that I got ill very often, missing days of training and damaging the confidence the other members of the crew had in me. One time I got so ill and depressed that I must have scared the hell out of my dad on the phone because he turned up on my doorstep a few hours later after catching the first train from Cambridge. The final straw was when I managed to inflame a tendon in my wrist from the boat overbalancing and catching my oar in an awkward position. 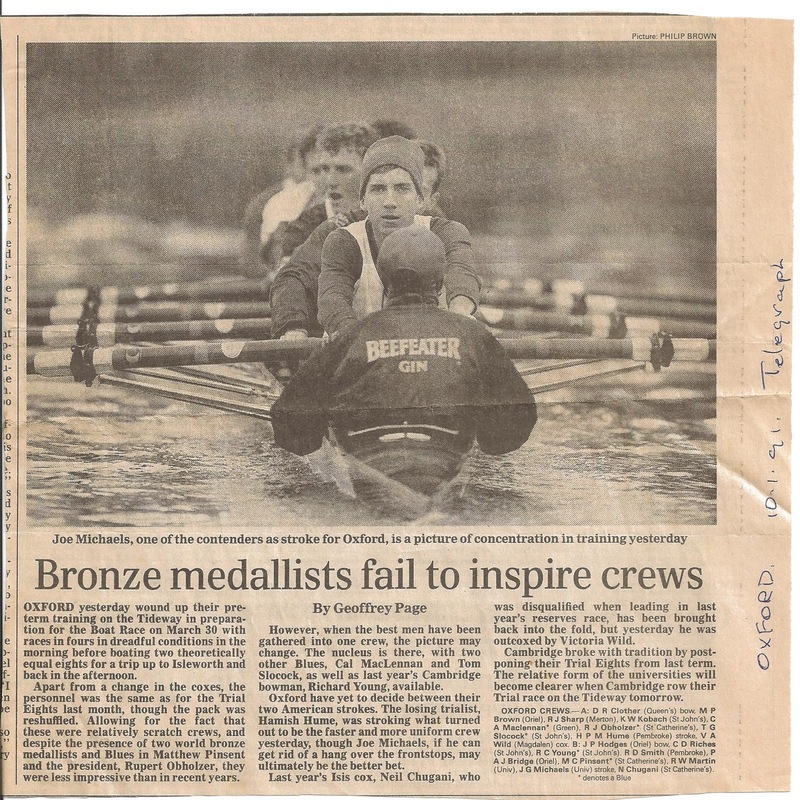 This was after 5 months of the 6 months of training before the Oxford Cambridge Boatrace (I had been selected for the Isis - Goldie race between the second boats). So you can imagine I was very pissed off and upset when I got "binned" - as they so tenderly called it - by Rupert Obholzer, but I was also incredibly relieved. All this happened exactly 20 years ago and yet it is still like a little splinter under my skin that, however much I pick and hack away, I can't dig it out. It was my first real experience of failure and of being rejected by "the group". I think it is one of the reasons I have chosen such a solitary sport as triathlon and decided to train in such a lonely way. I don't want to depend on anyone else or on anyone else's opinion: this is my personal test and noone can say whether or not I get to take part or not. It has occurred to me that crossing the line at the Ironman in Brazil can, in my mind, be equated to competing in the Boatrace and will hopefully allow me to dig out that annoying little splinter at last.